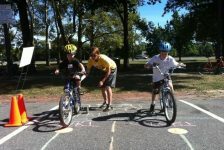 As Outreach Coordinator for Neighborhood Bike Works, part of my job is to manage volunteers for the various youth and adult programs run by NBW. It was in recruiting volunteers for the adult repair co-op, Bike Church that I stumbled on a dilemma: it is really hard to get volunteers for Women and Transgender night. With fewer (or sometimes no) volunteers on these Wednesday nights, patronage for W-T night also drops. Fewer volunteers can accommodate fewer patrons; fewer patrons mean less need for volunteers, and so on until this December when W-T night came to a standstill. So why not just accept this and move on? Because NBW aims to create a safe, welcoming environment to everyone who lugs their bike down our staircase. Safe means an environment explicitly welcoming to women and trans* folks. Safe means being able to focus on learning bike repair rather than on dodging unintentionally offensive interruptions from fellow patrons. Back in 2004, the staff at NBW discussed the issue of providing a safe space with other cycling co-operatives around the country. We were overwhelmed by the arguments for a women and trans only night and have supported that decision ever since. Hosting a women and trans only night is one attempt to welcome women and transgender individuals into our shop and support the growth of women and trans cyclists. We know there is a need to support women and trans cyclists in particular because despite making up more than half of the general population, women take far fewer bike trips. 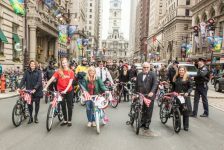 According to the 2008 Bicycle Coalition of Greater Philadelphia study, in the Delaware Valley region, between 22-34% of bicyclists are women and 64-76% are men. Data on cycling by transgender people is absent. Additionally, NBW offers a W-T night because spaces in Philadelphia which explicitly welcome women and trans people can be counted on one (maybe two) hands. Thus opening our shop for two and a half hours every week to just women and trans individuals offers a valuable, welcoming environment that simply does not exist elsewhere. The staff at NBW discussed providing a safe space with other cycling co-operatives around the country. We were overwhelmed by the arguments for a women and trans only night and have supported that decision ever since. We acknowledge that every night and every place should be free of misogyny and transphobia, but until the world catches on, we will offer a space that intentionally upholds values of nondiscrimination. We can’t do it without you. With our current lack of volunteers to pitch in on Wednesday evenings, our most acute volunteer need is for women and trans cycling enthusiasts who want to keep alive the valuable tradition of women and trans nights. If this describes you, please get in touch with us to talk about volunteering. We invite you to offer your ideas, and just as importantly, your time and expertise, to making Neighborhood Bike Works a safe, productive learning space for everyone who walks through the door. * We mean trans to include all gender identities beyond cisgender, i.e. transgender, genderqueer, nonbinary, genderfluid, and so on.